I’m calling this part four of the Static vs Air posts because it will really show how the two cars sit following the suspension work. 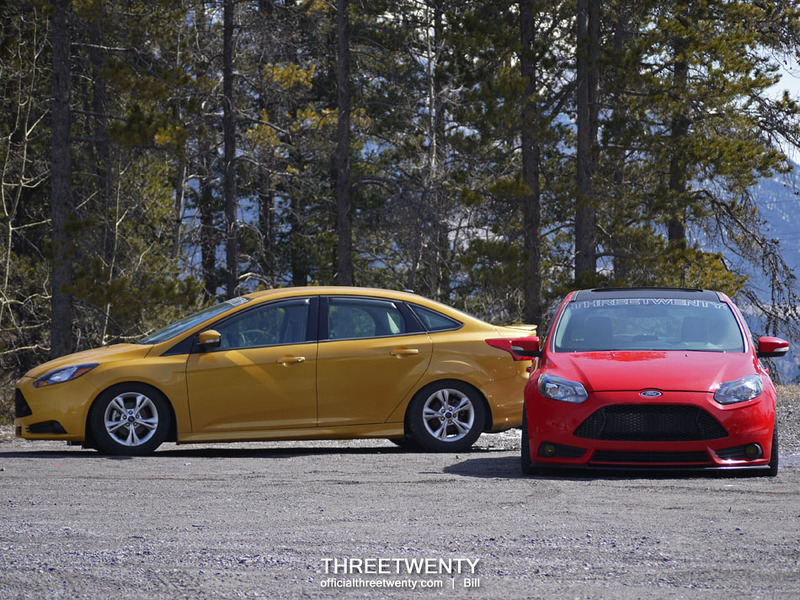 As usual, the ST is lower than the sedan but for the record, I was slightly lower for a very brief period of time while we were both on coilovers….but only if you were measuring the rear ride height. So close, yet so far. 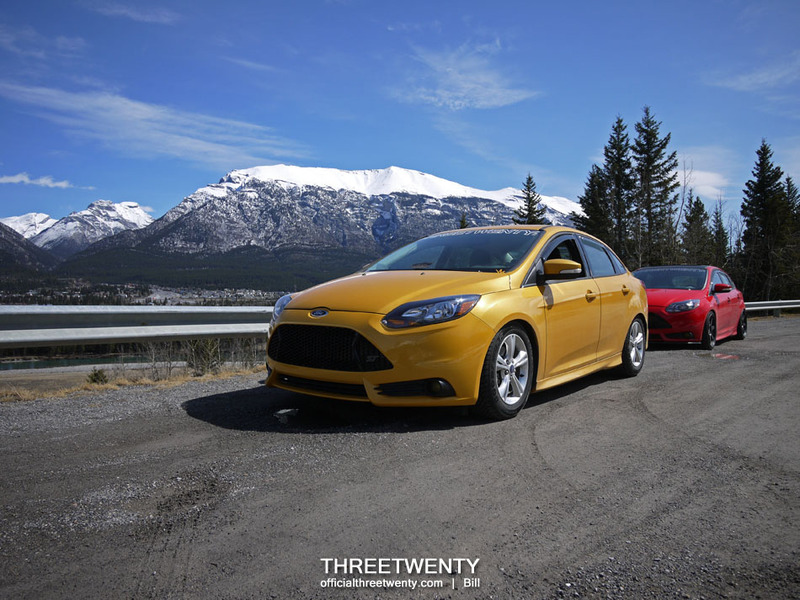 Anyway, recently Mario and I had the two Foci out in Canmore and we thought it’d be fun to do another mini photoshoot at the same spots we used last fall. They were nice locations and that way we could compare photos later on, of last year and this year to really see how the cars had changed. Neither car had been washed but it was a nice day and we had the chance so we took it. I have already changed wheels multiple times this season and this was one of those times when I was back on the OEM 16s. Obviously I would have preferred the Tarmacs but the weather was too uncertain for me to risk it (despite it being beautiful for the photos). They look incredibly small on the car now and I’m starting to think it’s time to upgrade to something bigger for winter…first world problems over here. However, the small and sunken wheels did highlight just how much lower the Focus was as compared to the last time it was parked here. When they were swapped on in preparation for the drive on the highway the front coilovers were also lowered all the way to bring the nose just a bit closer to the ground. It’s possible to go lower still but that would require taking out the helper spring and I’m perfectly happy with how it sits now. I had been waiting to bring the nose down another fraction of an inch and it made a lot of difference in my eyes. Meanwhile, Mario is almost tucking wheel in the back. The ST gets an unbelievable amount of attention when he dumps it at shows and meets, and plenty of questions as to how he drives it this low. We still laugh about the crazy weekend in the garage when we all installed this and look back knowing it was worth it. Thanks again everyone for helping! I wound up having more photos of the ST which I liked and wanted to post, so you’ll mainly see it here today. Sorry sedan. A little while after the photos here we did make an attempt to get the front of the car to drop more, hoping to have the same amount of tuck as in the rear. Both pinchwelds were flattened, thinking they were the culprits for the uneven height, but unfortunately the front didn’t drop too much more. It would appear the suspension is now at its lowest possible point so something else may have to be done. Even so, the stance is amazing and when Mario installed his new summer wheels (which you’ll see soon!) it was even better. 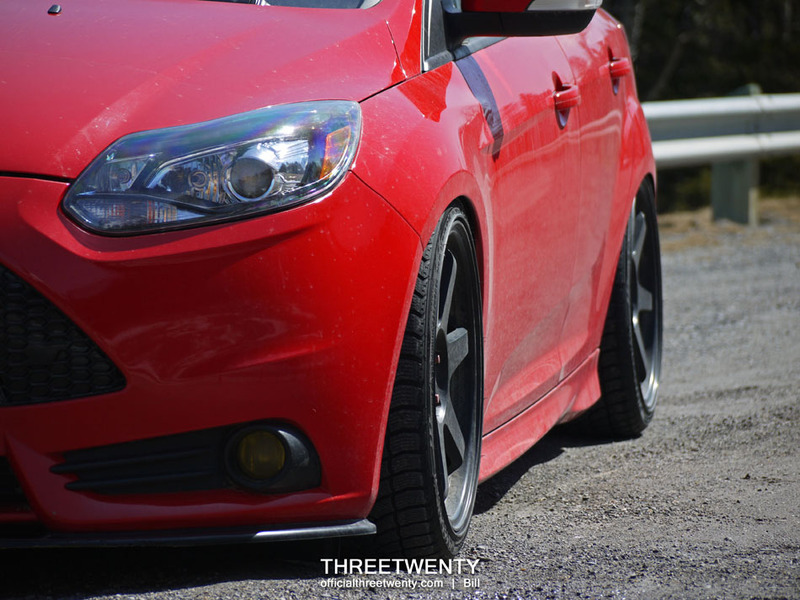 A lot of math on his part and careful planning resulted in fitment which is simply jaw-dropping. You won’t have to wait long though, as the next post on the blog will be about the ST’s new shoes. Despite all of the wheel styles fitted to Mk3 Foci so far, this is something that hadn’t been seen before. Previous Post Previous post: Is that an ST sedan? Next Post Next post: New Shoes. Again.